May 5, 2013 by Verle L. Bell, M.D. MERCY-can it feed into sin? God’s ways never lead to sin, but my response to them can be to sin more. As in Paul’s day where they argued that if their sin led to God pouring out grace which made God look good, then how could he be mad at them for sinning? Maybe I should sin so that grace can abound! GOD FORBID! If I ask for mercy, and if I mean by that, that God should take away the consequences of my sin without my full repentance. That God should bless me and use me anyways: then, if he blesses me and uses me in spite of my sin, I will believe that my sin is not that bad. For example, a friend of mine was on his second marriage and was struggling with consequences of abandoning the first. I told him that if he acknowledged that God wanted him to stay with the first, if he asked for and accepted forgiveness, thanked God for the consequences that were leading him to consider the wrongness of his choices: then God would come into his current marriage and lend it all the power and rightness of a first marriage. His new wife would not have to worry about the possibility that this one could go the way of the first one. He used the fact that God was letting him have ministry opportunities at church to say that there was no need for repentance. The first modern missionary, William Carey, made the mistake of abandoning his wife and heading for India, God had him thrown off the boat and sent back to England where she decided to come with him. However she had already had him say, by his sinful behavior, that “the ministry is more important than you are”. This led to insecurity, and nine years of psychotic depression before she died. Furthermore his actions poisoned the church. The lie that ministry is more important than family has persisted in the evangelical church to this day. What was God to do? He willed to reach the world through modern missions and did so but in blessing Carey’s work the lie was also strengthened. If Carey had seen God’s chastening and told his wife that he would never go to India until God led her in the same direction and asked her forgiveness for his abandonment of her, the lie would have been dramatically crushed, she would not have crashed into depression, and God could have freely blessed the ministry . LORD, THANK YOU FOR CONSEQUENCES. 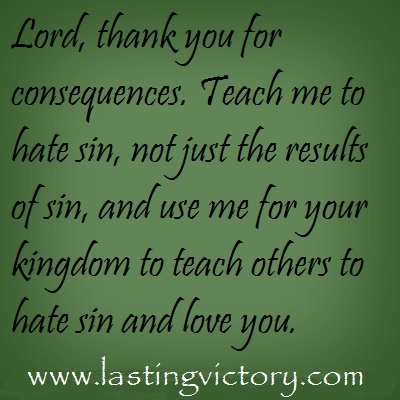 TEACH ME TO HATE SIN NOT JUST THE RESULTS OF SIN, AND USE ME FOR YOUR KINGDOM TO TEACH OTHERS TO HATE SIN AND LOVE YOU.